The team met at Heathrow’s Terminal 4 this afternoon, having flown in from all parts of the UK and Ireland. This year the wife of my best man, Janet (that’s her name, not his!) is on the team once again. Liz is accompanied, this year, by her nurse Su. 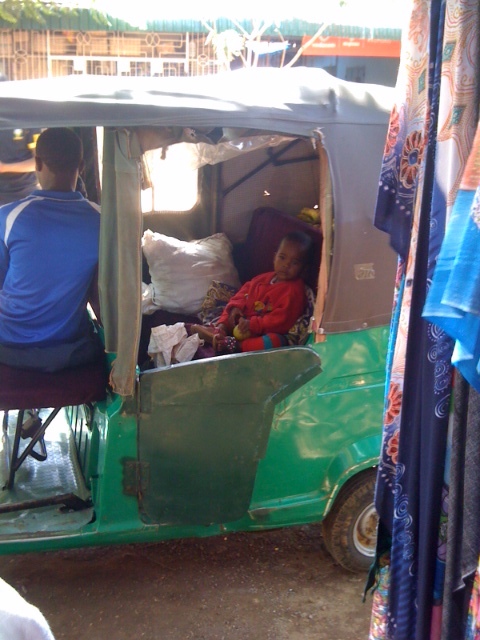 This is Liz’s EIGHTH trip to Tanzania with Bridge2Aid. They met at Terminal 4, and not Terminal 5, as British Airways have ceased their flight to Dar-es-Salaam and so they are flying on Kenyan Airlines, via Nairobi. Brian Westbury, one of the team, sent me this photo from the airport. Liz tells me that he is concerned about missing The Archers but I am sure that he can catch up. Last time I listened, Shula had just returned from Thailand and Nelson Gabriel was running a wine bar ! If they can find WIFI access, this year's blog should be enriched by photos from Brian's iPad. Flight KQ 101 was due to depart at 19.00 and was actually airborne at 19.14. 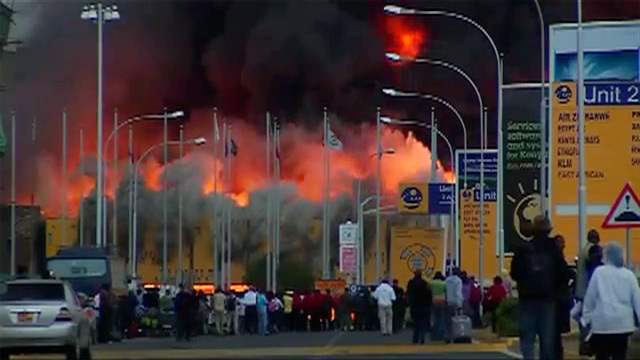 As you may recall, Jomo Kenyatta International Airport at Nairobi suffered a disastrous fire in August last year (see picture) and so Liz was quite pleased that, at least on the outbound journey, they did not have much of a stopover. They were due to land at 06.30 but actually landed at 06.07. Apparently the flight was not full and so Liz was able to lie across 3 seats and got a lot of sleep until they were all woken up with a request for a doctor as one of the crew was ill. In the wake of the Ethiopian Airlines skyjack, I imagine that the pilot was anxious not to go to the toilet in case the co-pilot took over and flew them to Geneva ! They then caught the Precision (in name only!) Airways flight to Kilimanjaro and then 4 hours by minibus to Babati, where they will be based for the next two weeks. Liz says that they passed both towns where the clinics are located where they will be treating patients. They hit a goat en route but .... worry not, it survived and I'm not kidding. They are based in the Silver Motel and, not managing to find anything at all about it on TripAdvisor, Liz was a little anxious at what they would find. Apparently the rooms are very small, but clean. The loo is described as being 'interesting', comprising a hole in the middle of the bathroom floor, next to the shower. She is concerned that she might lose the soap down it! I think, somehow, that she will be best advised to stay in the bedroom to put her contact lenses in. The food was a curry with meat of some unknown variety, which has prompted Liz to become a vegetarian. The hotel staff were all getting ready to watch Man City vs Barcelona. Tomorrow they will honoured by the presence of the Regional Commisioner, who wants to meet the team. Many thanks to readers who have already been in touch with me, including one of the Bridge2Aid volunteers, Elaine Gaffney, who has only just returned from Tanzania herself. She said she wishes she were back out there with the Babati team but surely she would rather be in sunny Lancashire ? So, where exactly are they this year? In previous years they have gathered for their 'orientation' in Mwanza (see map), up on Lake Victoria, where the charity runs a fee-paying clinic to help generate funds. As they have already trained a lot of clinical officers up in that area, they are now moving further afield which is why, on this trip, they are centred on Babati, some 230 miles away, as the vulture flies. They had their orientation day and learned that B2A has now trained 304 clinical officers across Tanzania. 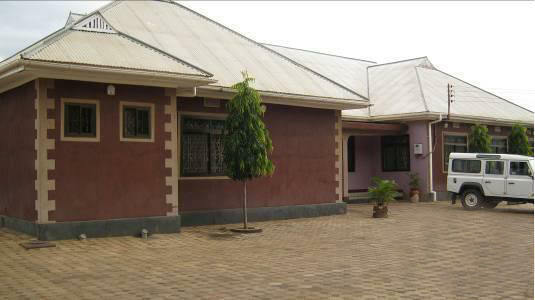 With sponsorship from A-dec they will be opening a new third surgery at the Hope Dental Centre in Mwanza. They also have sponsorship from Whitedent and will be giving out toothpaste samples to each patient. First thing this morning they went to some lovely government buildings to meet the Regional Commissioner. As they waited for him to arrive, they felt like the apprentices, waiting for Lord Sugar. They also went to the school of St Clare of Assisi, where the whole school sang a medley of songs, including ‘If you’re happy and you know it’. The youngest ones were having a nap, which was cute. They start the training in earnest tomorrow. 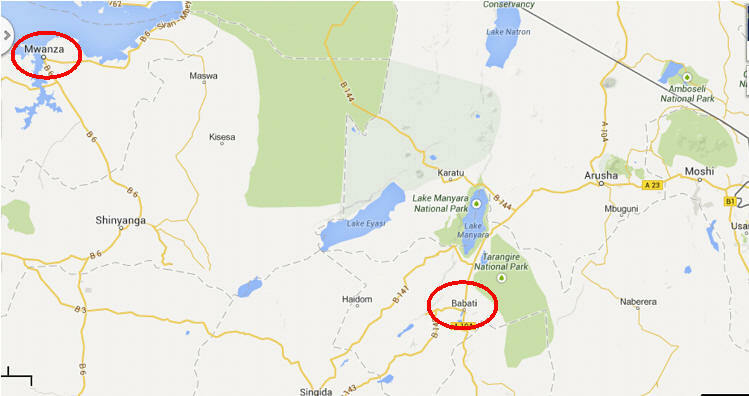 The first clinic is in the town of Minjingu, on the shores of Lake Manyara. The people are mostly Maasai 65% of the people are farmers and rest work in the local manure/compost factory. The clinical officer who is based there is responsible for 13,000 patients! Despite the fact that they will be based at his clinic, they will not be training him this time but other COs from the surrounding area will be trained. On a wildlife update, Liz saw a Southern Bishop in a tree next to the motel. By way of reassurance, this was not Desmond Tutu engaging in yoyeurism. A Southern Bishop is a type of bird, similar to a weaverbird (see picture). It rained heavily today; just like home then ! This afternoon the photo opposite came through on my mobile phone whilst I was at work. 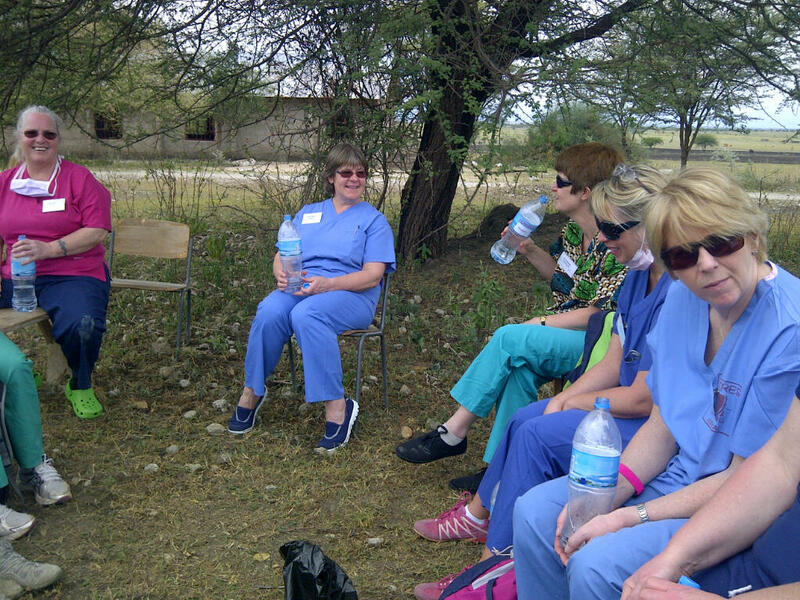 It shows the team having a well-earned rest at the clinic in Minjingu (a name that you couldn't make up!). It's amazing to think, isn't it, that just 150 years ago it would have taken you about 3 months, travelling by sea and land, just to get to that point and set up your tripod ! It had rained torrentially all night, as it only can in tropics. As a result, they did not know how many people would turn up but they saw 66 patients today, including some boys from a local school. The clinic is basic; some solar panels seem to be powering a fridge which contains some vaccines and ice lollies! They have sinks but ..... quelle surprise..... no running water. One of the strip lights is working but the overhead fans are a decorative feature only. Liz has been training Atanasio who has 6 children, two of whom are themselves clinical officers.The clinic is solely maternity and a midwife called Alta was seeing patients in another part of the building. When she was not been cleaning up projectile vomit from one of the patients (it missed Liz!) Janet looked after an 8 week old baby, whilst Mum was having a tooth extracted. Lunch for the team was excellent, comprising rice and a veggie curry. Janet and Brian have confessed to the team that their motel rooms have sit-down toilets and so they may find themselves quite popular. The clinic is near to a national park and, of course, there are no fences. Liz texted that she saw a herd of zebras and some lovebirds on a roof. I have pointed out that I was not aware that zebras were particularly good climbers and that it was a shame that the romantic tryst was disturbed by a group of herbivores (lovebirds are, by the way, a type of small parrot). Before I forget, a big THANK YOU to Lindum Rotary Club in Lincoln, who donated enough money to fund all of the equipment that the team will be using on this trip and the kit that they will leave with each clinical officer. Today’s email came through with a request for an update on the curling ! There was nobody there when they arrived at the clinic and they thought they would be playing Jenga all day. How appropriate, given that its name derives from Kiswahili. They did not even have time to set up the blocks, however, and eventually saw 90 patients, many of whom have very stained teeth, prone to flaking, because there seems to be an extremely high natural level of fluoride in the water. Liz trained Susan today whilst the mother and baby clinic operated next door. Many of the Maasai women have amazing outfits and beads and a lot of the babies have tribal marks on their cheeks made with hot instruments – OUCH ! One 25 year old woman took a photo of Brian on her mobile - either attracted to the ‘more mature man’ or proving that there are opportunities for SpecSavers to open branches n Tanzania ! Hyena sighting turned out to be a mongrel but they did see some baboons, storks and speckled mousebirds. Brian is having problems sending through photos and so I thought that you would welcome a library photo of the Minjingu fertiliser factory ! I have also found that the background radiation level in that area is particularly high, which is equally worrying for the local population. I expect the team to come home glowing. Today's photo, in deference to yesterday's blog entry, is a photo of some lovebirds that Liz took on the B2A trip last year (no, the birds did NOT accompany her on the trip!). Liz sent a text from the bus on the way back from the clinic. It was very hot today and Liz fell in love with a Maasai tribesman; he already has 2 wives and 16 children ! She was able to text because they had been stopped by a huge herd of goats, donkeys and cattle being looked after by a few Maasai boys. They have finished at Minjingu and are dropping all of their stuff at the second clinic at Magugu (no, I have not made up the name) which is nearer to Babati. Liz trained Stephanos today, who was a real gentleman and introduced her to every patient. Today's wildlife spot was a crested eagle sitting on a post - I am not aware that Liz has seen one before. They were hoping to watch the rugby on the TV but they had to settle for football instead. There were a few drinks riding on the result as there are two Irish nurses on the team. Liz described the electrics in their motel, which sound decidedly 'dodgy', with wires wrapped around the shower-head ! Two of them have already had shocks. 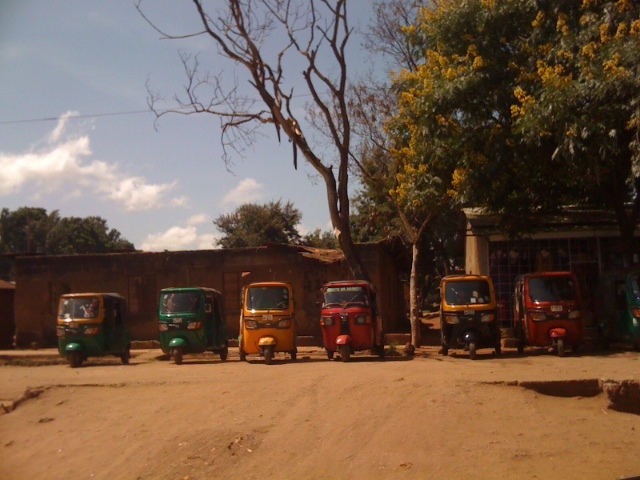 Tomorrow is a rest day and so they are off to the market and then lunch down by Lake Babati, where there are hippos. 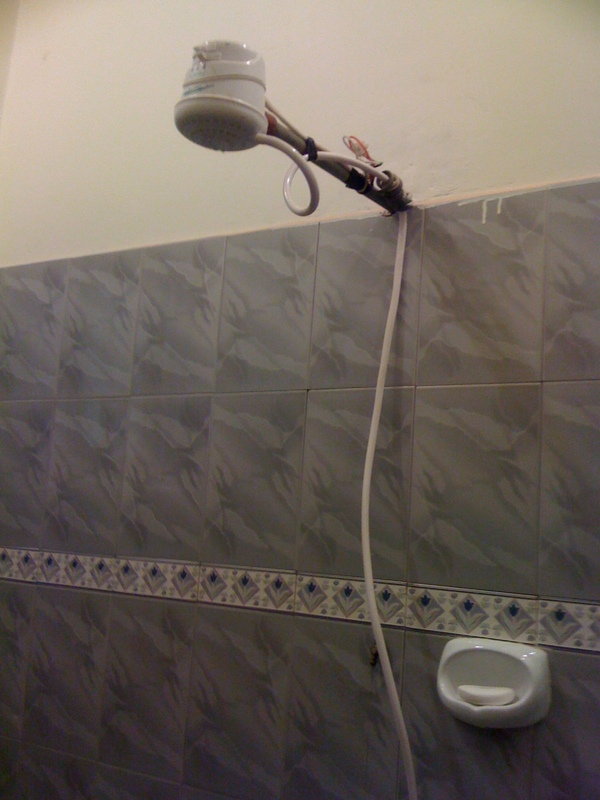 Following on from yesterday's shower story, Liz managed to send me a photo of the shower head. Not sure that Tanzania can have a Health and Safety at Work Act! 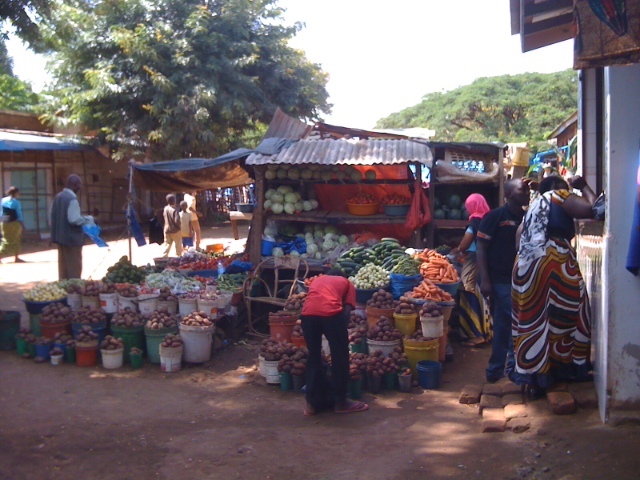 She also sent through a few photos of their trip to the local market and of life in Babati (see below). 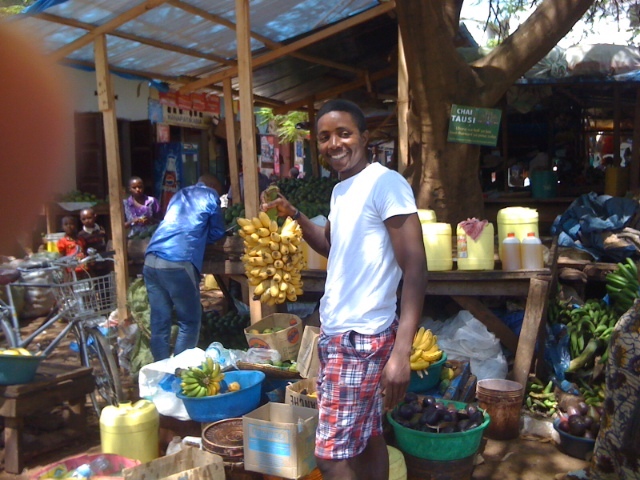 Apparently all of those bananas cost just £3.50. Leter in the day I received a text that she sent from the shores of Lake Babati, where she and Janet had gone for a walk and seen a monitor lizard in the water. They also saw glossy ibis, pied kingfishers and malachite kingfishers. 5 of the team had gone out on the lake to see the hippos; there are, apparently, about 100 of them. They don't seem to have many guests (the hotel, not the hippos!) 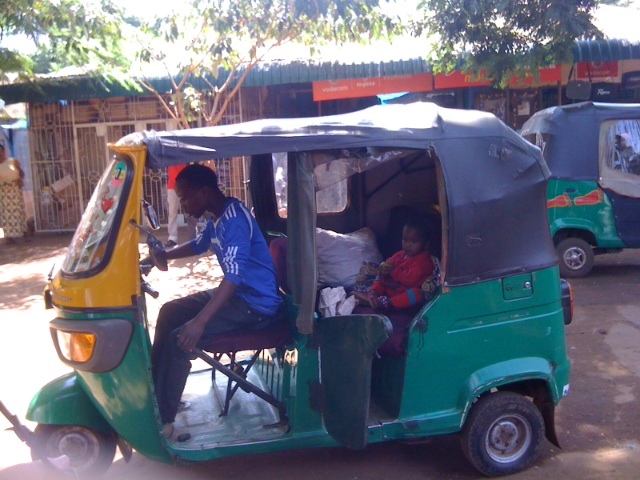 and the outboard motor turned up in a tuk-tuk. The alternative - dug-out canoes - may well have been a better bet as the motor cut out in the middle of the lake and then one of the crew dropped one of the oars in the water. They took a long time to get back after Haji (their 'fixer') fashioned an oar from a piece of plastic piping and they made a sail out of a sarong! Beats Swallows and Amazons ! I was under strict instructions, yesterday evening, to make sure that I recorded Call the Midwife and Mr Selfridge. I texted Liz to advise her of the surprising news that Sister Evangelina had turned out to be a man in disguise and that Mr Selfridge had sold out to ALDI. There are enough pictures on that site and so today we have a malachite kingfisher, which Liz saw yesterday. One of the most experienced of the B2A volunteers, Kiaran, got in touch yesterday. She and Liz will cross in the air as she is off next week to train more clinical officers, this time on Ukerewe Island, the largest island in Lake Victoria. Today they saw 71 patients but, as always, the treatment of patients is a 'by-product'; the main aim is to train the clinical officers to be able to carry oin the good work after they have left. Two of the COs are sisters but Liz trained Wenceslas today which was not easy as he had left his glasses and training manual on the bus ! They are actually working at a hospital but tomorrow the room they have been allocated will be used for a clinic and so they will be outside in a waiting area. This may actually be a blessing as it has been extremely hot today and the humidity built up and then cracked open into yet another tropical storm as they made their way back to Babati. At one point in the day Liz treated a young girl who was from one of the wards in the hospital. She was on a drip as she had malaria. Do remember that a net only costs £5.00. Liz noticed that one of the staff had Babati Rotary Club on the back of his white coat; turns out that lots of the government officers are members and that they do a lot of fund-raising for the hospital. Today's wildlife spot was several unidentified storks in a tree, one of which decided to poo on Liz ! It's always gratifying to get feedback from readers of this blog and today I am delighted to report that I have received an email from the parents of Kirsty, one of the dentists on the team. They send greetings from New Zealand, where they are currently on holiday. One of the members from our church had sent greetings from Suffolk, where he and his wife were spending a few days, but I think that New Zealand trumps that ! Liz sent me an update from the steps of the clinic, where she was waiting for the rest of the team to finish. They had been extremely busy today and had seen 128 patients. Liz trained Roser, who was very good. The Regional Dental and Medical officer had been with them for the day and was very impressed with the quality of the training. He is a Maasai himself and comes from a tribe that lives on the slopes of mount Kilimanjaro. 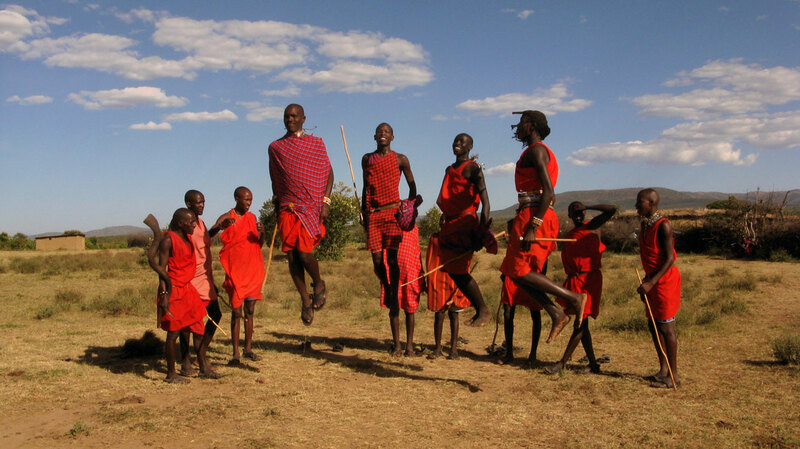 He showed the team a video of the coming-of-age celebration of Eunoto, in which the men perform the adumu (see right), a dance in which they try and jump as high as they can, from a standing start, in order to impress the women (the things we do in the course of courtship!). The Clinical Officers did their written exam today and Brian and Liz have been marking the tests. Paul Brind, the Mwanza-based Clinical Director of the charity will be coming down to Babati tomorrow to find out how the team has got on in the new area. The lady who cleans the rooms in the motel accompanied them on their bus this morning and was Liz’s first patient. I bet that Liz was keen to make sure that she was well treated ! Given the working environment, Liz always takes old T-shirts with her and, when she got back to the motel, she gave some of them to the hotel staff. As always, she was quite amazed when they asked how much money she wanted in return. In the briefing notes that Liz was given, before she went out, I have found a photo (left) of the Motel Silver in Babati. It actually looks reasonably modern ! I was contacted yesterday by another B2A 'veteran' (hope she won't mind that term), Judy Beckerson, who is also going back out to Tanzania next week. Ukerewe Island won't know what's hit it! I see from Wikipedia that the island has a large population of albinos. Readers of this blog in previous years will know that, in Tanzania, albinos are often killed and their body parts sold to witch doctors as good luck talismans. I see, from the Bridge2Aid website, that the charity has now trained 300 Clinical Officers, which means that over 3 million people now have access to basic dental care who previously had to suffer toothache. Liz was training Paschal today and by the time the training finished for lunch at 13.30, they had seen 103 patients which made for a VERY busy morning session. All of the Clinical Officers passed and were duly presented with a certificate and their own dental kit, which included a head-torch (invaluable, given the absence of electricity). They were each delighted with the torches and had their photos, taken wearing them. Haji, their ‘fixer’ stayed up to watch the football last night and, like myself, was disappointed in MANU’s abysmal performance in Greece. Further feedback today…. I received an email from Patricia, the sister of Cathryn (one of the dentists) who has been enjoying the blog and hoped that her sister had got some good bargains (see photo in entry for Sunday 23 Feb). Odd to think that, last night, I met for dinner at Hungerford with Tony, Janet's husband. By Saturday he will be out there to meet her at Kilimanjaro airport before they go off on holiday. 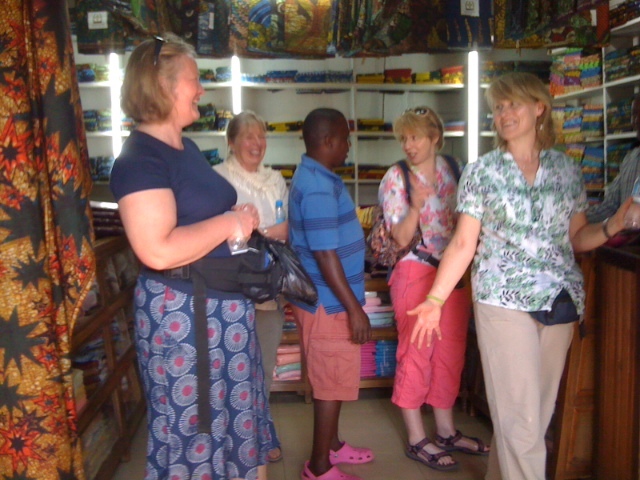 Liz and some of the others set off at 07.00 this morning to go on a well-earned mini-safari at their own expense. They will be staying at Lake Burunge Tented Camp and then visiting Tarangire National Park. This looks rather nice and should be quite a change from the Motel Silver. 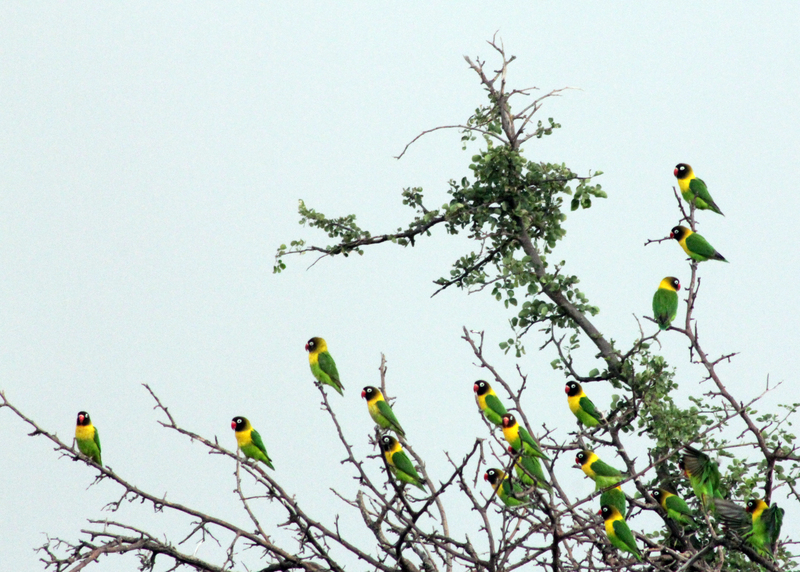 The wildlife in Tarangire is wonderful. On the right is a photo that one of the team took on the trip last year of two lionesses on a termite mound - very Born Free ! I received a text from Liz when she arrived at the camp. They entered the National Park at 08.00 and left at 15.30 and so everyone is exhausted. They were in two jeeps and, at one point, one of them got stuck crossing a river and had to be bumped and towed out. At least there were no crocs of hippos as the water was not deep enough. 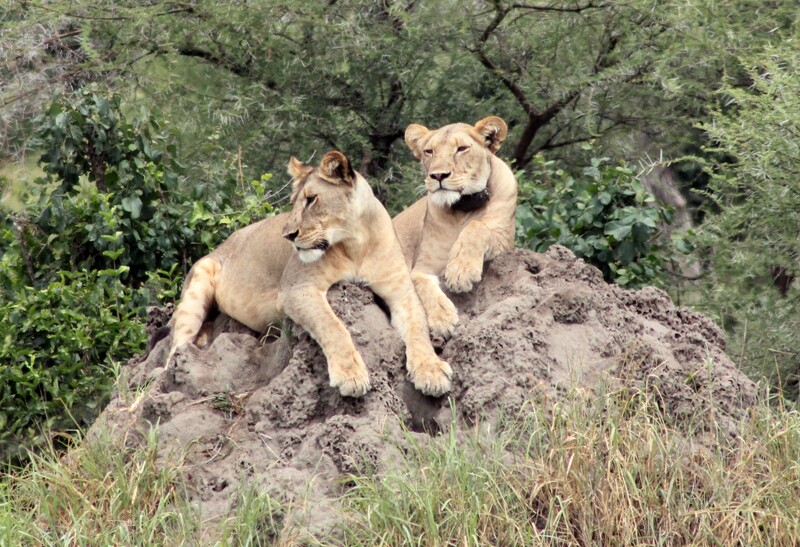 They have seen various species of antelope and 3 lionesses with 2 month-old cubs. There are hundreds of elephants and they also saw a family of black-backed jackals with 4 puppies (or cubs, depending where you look it up! ), zebra, giraffe, buffalo, etc. Bird sightings include the very odd secretary bird (see picture), storks, ground hornbill and ostriches. The camp is tented, which just means that the walls are canvas…. this is not Scout Camp ! The rooms are up on stilts and quite widely spaced apart, which should make it interesting tonight as there are never any fences around these camps. When she spoke to me after dinner, she had just been escorted in the dark to her tent. She had left the sides open and could hear a hyena in the background. She was woken by a hyena (right) during the night. 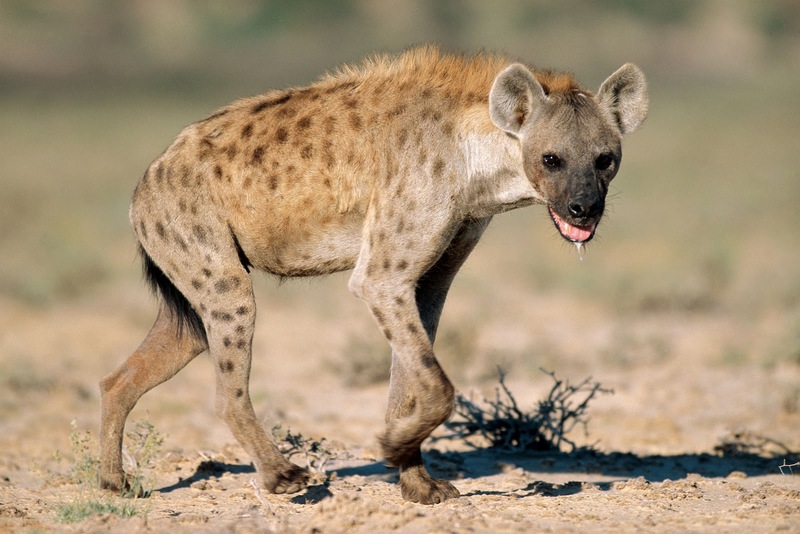 Looking at the photo, do hyenas have any redeeming features ? Technically, I suppose I should say that she was awoken by the 'sound of a hyena'; after all, it's not as if a hyena climbed up into her cabin and shook her awake. She went out VERY early in the Jeep with Janet and Brian and saw several wildebeest (gnus) and a family of mongoose. Later they (the humans, not the mongooses) went for a walk by the lake, as it was so hot, while the others went out for another safari and saw (and went under) three leopards in a tree. I was sitting in a restaurant on Shaftesbury Avenue this evening, having a meal with our son, Adam, when Liz phoned from the tented camp. The power of communications ! She has been bitten by a number of tsetse flies (they are nasty things and always appear to like her) and seems to have an allergic reaction to them and so is dosing up on anti-histamines. Liz phoned me from Kilimanjaro Airport (so much more exotic than 'Stansted' or 'Gatwick') to say that she had been kept awake by a hyena crunching on bones immediately beneath her cabin - quite a scary noise! Her hand and ankle are now quite swollen from the tsetse fly bites. They had met Tony at the airport as he had landed earlier in the morning. He and Janet have now gone off to more National Parks and the beach. 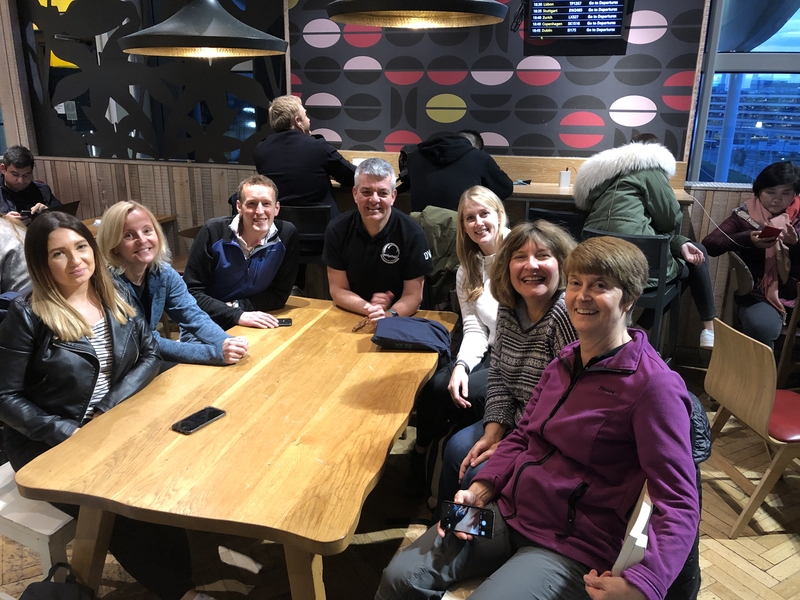 Their flight to Nairobi was delayed, which is no bad thing as the delay has eaten into the EIGHT hour stopover in Nairobi before the 9 hour flight back to Heathrow. They are due to land tomorrow morning at 05.45. Total journey time from tent to home will have been just about 24 hours! The flight was further delayed when one passenger failed to board the plane and they had to take his/her luggage off. 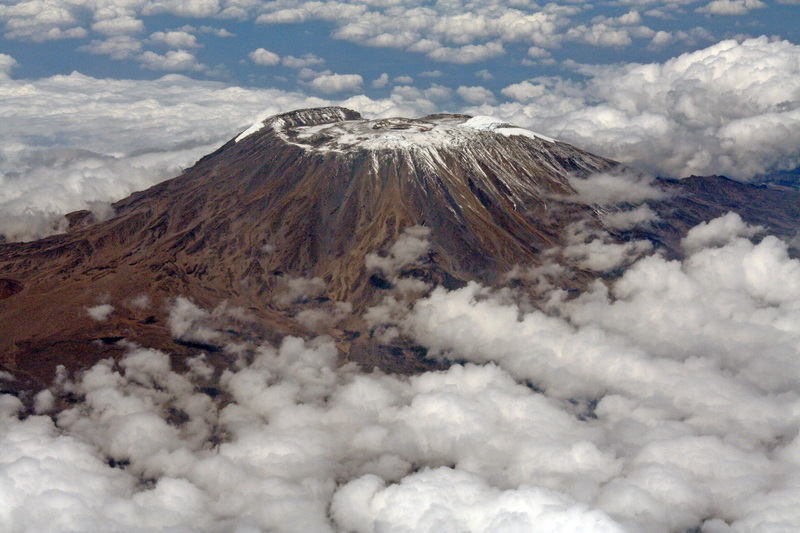 Featured left is a photo of Kilimanjaro that Liz took from the plane on a previous trip. Flight KQ 102 from Nairobi landed at Heathrow at 06.12 and Liz is now back home. I hope that you have enjoyed the updates. Signing off until this time next year.